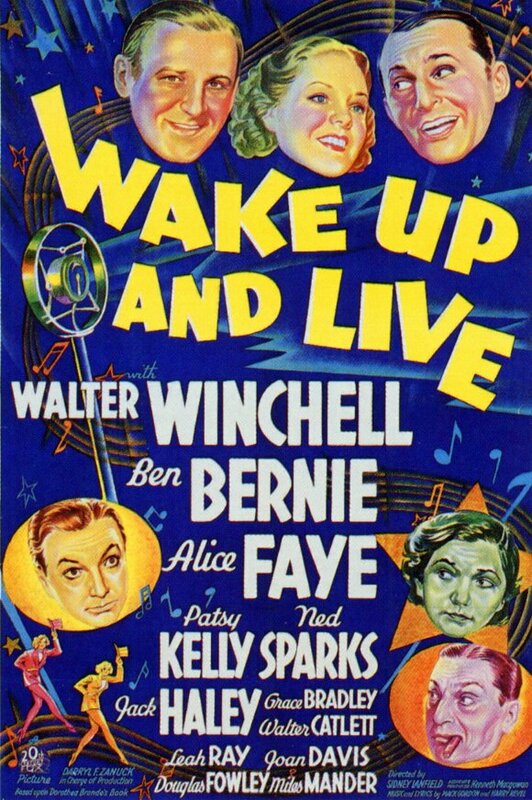 In honor of the 6th Annual Mid-Atlantic Nostalgia Convention this September, I am offering a preview of Bob Stepno's article about Wake Up and Live, a 1937 musical-comedy, scheduled for screening at the convention. Enclosed is a preview of Stepno's article (among other articles written by knowledgeable figures) that will appear in this year's program guide. 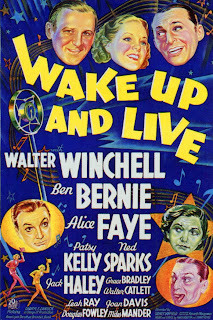 More than a half-century before Howard Stern proclaimed himself “King of all media,” Walter Winchell could have claimed the same title, and the film Wake Up and Live would be one of the jewels in his crown -- his first role as a Hollywood leading man. The musical comedy hit from 1937 features Winchell and bandleader Ben Bernie, playing themselves, in a plot that takes place during the heyday of network radio and the pre-war nightclub scene. Both were common motion-picture settings during the thirties and forties -- who could forget Bud Abbott and Lou Costello’s 1942 comedy, Who Done It? The plot: Backstage, a would-be crooner paralyzed by the microphone equivalent of stage fright practices singing-along to Bernie’s band -- not knowing that he’s using a live microphone during a broadcast. No one can identify this “Phantom Troubadour,” but listeners love him and fan mail pours in. The search for the mystery voice pits Winchell against Bernie in a battle of wits and quips -- the two having had a long-time fake feud on their respective radio shows in the same manner as Fred Allen and Jack Benny. The crooner is played by Jack Haley, two years before his tin-woodsman role in The Wizard of Oz (1939). This time, however, it is he, not the Cowardly Lion, looking for some courage. Leading lady Alice Faye (who sings the title song) plays the sweetheart who tries to boost his self-confidence with the kind of self-help psychology promoted in a popular book of the day by Dorothea Brande, from which the musical took its title. Wake Up and Live, is, after all, a musical, but with more plot than musicals of the time. Songwriters Mack Gordon and Harry Revel wrote nine new songs for the show. Patsy Kelly, Ned Sparks, Grace Bradley, Leah Ray, Walter Catlett, the Brewster Twins, the Condos Brothers and Joan Davis round out the singing and dancing cast. The “hoofer” part was true. 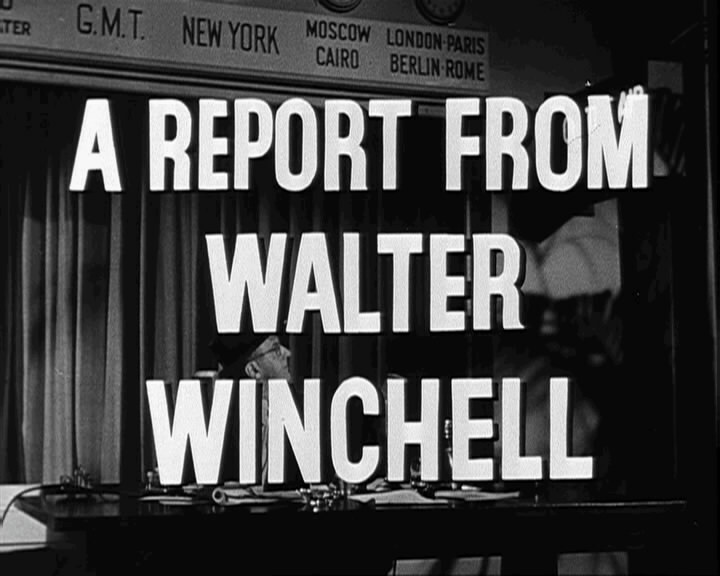 After a brief vaudeville career of his own, Winchell started a backstage gossip newsletter that led to his career in newspapers. That began during the Roaring Twenties at the sensational daily tabloid the Evening Graphic. As his fame grew, he jumped ship to work for the competition, Hearst’s Daily Mirror -- advancing syndication to more than 2,000 newspapers. 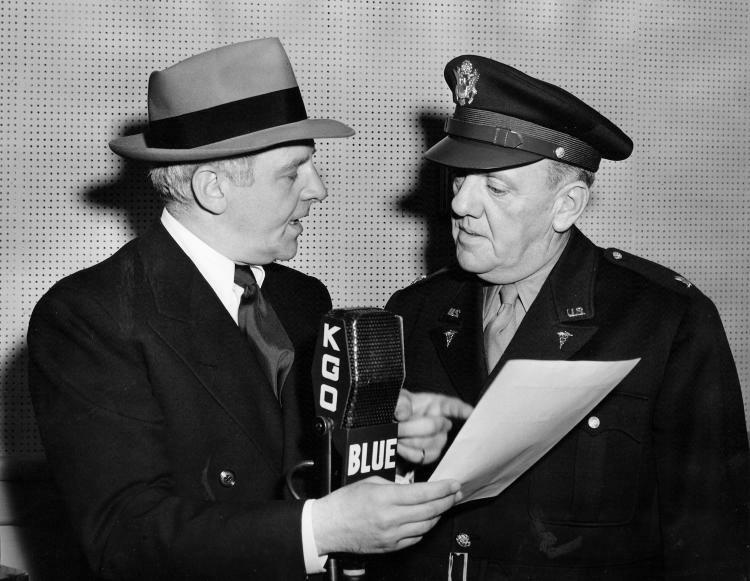 Walter Winchell (left) before the microphone. 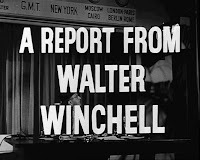 Perhaps more than anyone, Walter Winchell helped establish the image of the American news reporter as a smirking, fedora-wearing, fast-talking insider, a regular at nightclubs and theaters, a friend of cops and gangsters, showgirls and moguls. And, in Winchell’s case, as a power-broker who could make and break careers with a mention in his column. As time went on, his columns and broadcasts became more political, first for Roosevelt and against Hitler in World War II, then for Joe McCarthy and against Communism during the Red Scare years of the 1950s. His style didn’t translate well to TV, but had a late revival when he became the narrator for the television program, The Untouchables, sometimes describing gangsters he had known and written about back in Prohibition days. But in Wake Up and Live, the biggest menace is Ben Bernie, and it’s all in fun. Despite admitting to a Ph.D., Bob Stepno keeps an old fedora with a press card in the band hanging by his desk as a reminder of his days at The Hartford Courant and The Raleigh News & Observer. Today his desk is at Radford University in Radford, Va., where he teaches journalism and media studies, and is researching the portrayal of journalists in old-time radio dramas. The result so far includes a blog and podcast, “Newspaper Heroes on the Air,” http://jheroes.com for short. 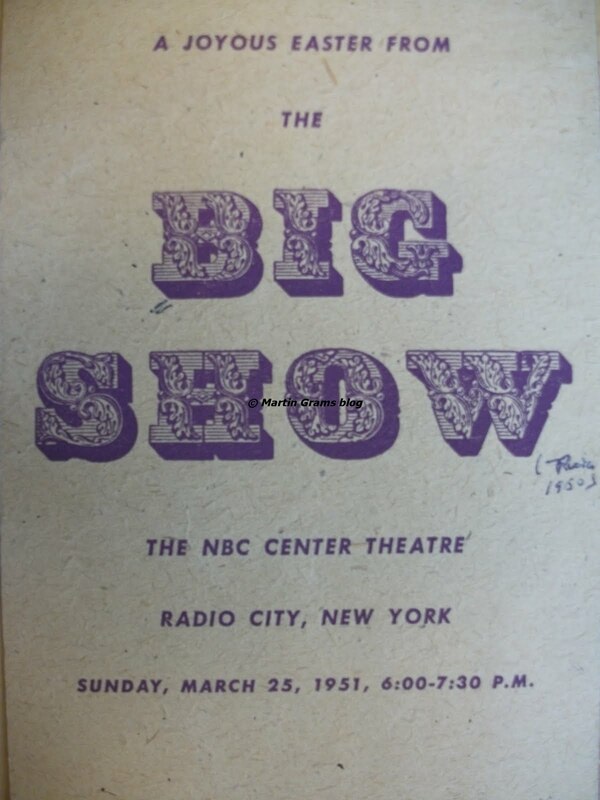 The Big Show was an NBC house-built package and an innovation in show business deriving its name from the fact that the talent roster each week included “the biggest names in show business” -- name guest stars chosen from ranks of music, drama, comedy in stage, motion-picture, concert, radio and television were all “top performers” in their own fields. The Big Show was the first program ever to be presented under NBC’s new sponsorship plan known as “Operation Tandem,” in which sponsors were offered participation in sponsorship of five top evening programs each week, no more than three sponsors to be included in each 30-minute program time. Prior to this, radio programs primarily featured only one sponsor throughout the time slot (although the same sponsor was able to promote more than one of their own products.) The “Operation Tandem” shows were described over-all as the “Five Show Festival” including programs whose formats were varied to offer drama, variety, music, comedy and mystery. 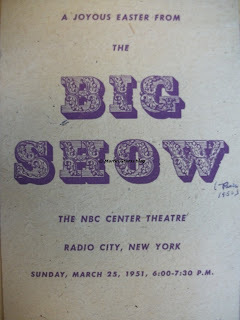 The format of The Big Show was a variety program with repartee, music, dramatic sketches, comedy routines, excerpts dramatized from recent motion pictures and current Broadway hits, novelty monologues and instrumental and vocal novelties, special “spots” paying tribute to outstanding members of show business and other salutes to the more serious side of living such as the meaning of living and playing in a country like America, etc. The Big Show ran a total of two seasons and by the time the second season premiered, excerpts of recent motion pictures had been dropped in favor of current Broadway hits. Program guide handed out every week. A great array of name guest stars each week were featured, averaging eight stars each week. The program was directed by Dee Engelbach, with James Harvey as the NBC producer (first season). 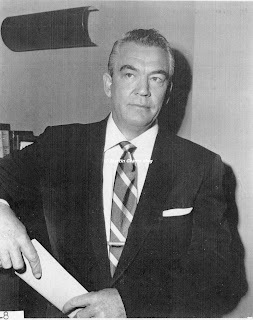 Script writers included Goodman Ace, Welbourn Kelley, Frank Wilson, Mort Green, Selma Diamond, George Foster, Joel Murcott, plus a number of collaborators depending on the guests’ needs. The musical background, bridges and specialties were arranged and in many cases composed especially for the program by the program’s musical director, Meredith Wilson. Special lyrics from time to time by Sammy Kahn. The chorus and choir consisted of 16 voices. Choral Master Max Teer oversaw the vocals for the first season, Ray Charles for the second, with over all musical direction under orchestra leader Meredith Wilson. Writers: Goodman Ace, Selma Diamond, George Foster, Mort Green and Frank Wilson. Others such as Joel Murcott and Dorothy Parker are indicated under their retrospective episodes. Music: Arranged by Sid Fine. All music supervision by Meredith Wilson. Broadcast of October 7, 1951. Ben Smith is the announcer for the Paris broadcast. On tonight’s program, Joan Fontaine does a scene from Letter From an Unknown Woman with George Sanders in the role of “the Man,” in the classic love story by Stephen Sweig (which was made into a 1948 movie starring Joan Fontaine). Fred Allen and Tallulah Bankhead then do a take-off on the story. Another special feature was the presentation of a scene from Dr. Knock, a comedy which starred the late Louis Jouvet, a distinguished actor who died a few weeks prior. In Jouvet’s memory, Fernand Gravet and French players play the scene in a special adaptation of Dr. Knock. Josephine Baker sang a medley that understandably drew an ovation from the Paris audience. The Paris newspaper France-Soir, surprisingly, termed Bankhead “truly irresistible,” and “an astonishing woman… something of a national institution,” and then mused: “Decisive, positive, she looks a lot like a Sunday school teacher. Yet she is celebrated for her extravagances and her audacity.” This was, however, the only French newspaper I have been able to find that spent more praise on Bankhead than Baker. The October 7 broadcast originated from the stage of the Empire Theatre in Paris, France. The program was recorded on September 24. The tape was then shipped to the United States where the network edited it for airing. Part of the 90-minute program was aired on the Light Program portion of Radiodiffusion Francaise, but the entire broadcast was not heard over European networks. The French system could broadcast only part of the show, since it had previous commitments for airtime. Pre-broadcast interest in the program was heightened by the opening of the Medical Congress, which would see the first demonstrations in France of the CBS color television system. Equipment was brought from Germany, where it was used by the Economic Cooperation Administration for the recent Berlin youth rally, for demonstration in surgical operations during the Congress. Two events occurring at the same time were making the French more conscious of American show biz than they had been for some time. 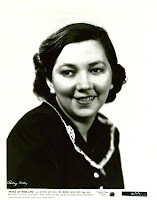 The chorus which backed the show last week in London was imported to France, but it was found that a local group, headed by Edith Constantine, who played opposite Edith Piaf at the ABC, was okay. 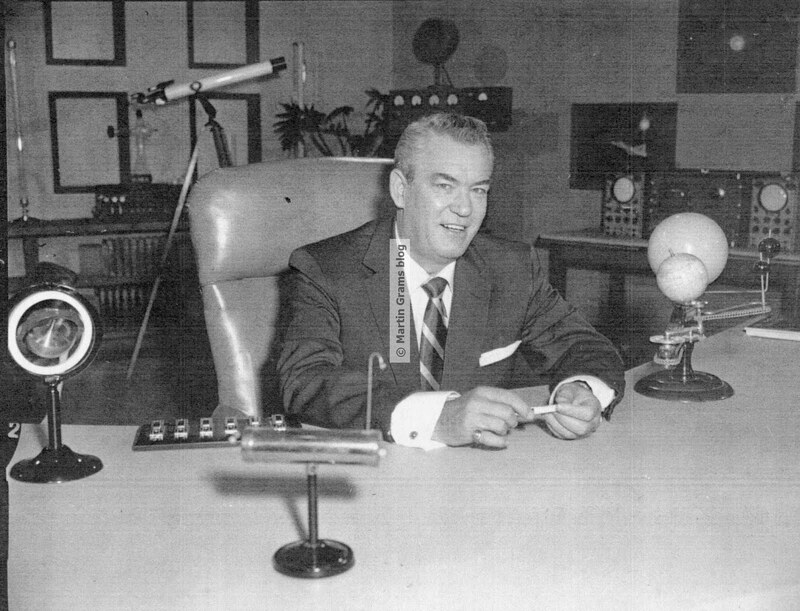 Several changes were made in the tape recording of the program before the October 7 broadcast. Gracie Fields sang some tunes from The King and I but since they could not be cleared for the U.S., she taped other tunes for the U.S. version. In addition, Georges Guetary, originally scheduled for the show, could not get a release from manager Maurice Lehmann, for whom he was currently starring in Don Carlos at the Chatelet. As a result, he taped some material for insertion in the program when it aired in the U.S. The theme of this episode (and what could be described as the title of the broadcast) is the “Southern Show Train” which originated in New Orleans and brought passengers to The Big Show from New Orleans, Natchez, Birmingham, Memphis, Atlanta, Columbus (Ga.) and Montgomery (Ala.) to attend the broadcast at Centre Theatre in New York, where The Big Show broadcasts originated. 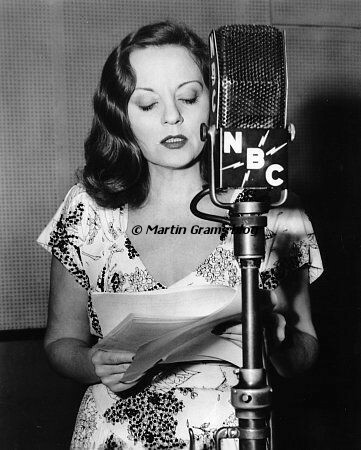 The train arrived the night before, October 13, and the passengers were entertained by Tallulah Bankhead, broadcast officials and sponsors. For the audience, the climax of the festivities was attending the broadcast of October 14. The running of “Show Trains” for the broadcasts from time to time originated last season and continued for this season, only once, with a “Southern Show Train” originating in New Orleans. Another purpose of the Show Train was to help publicize the new season of The Big Show, through newspaper articles in numerous cities. The broadcast included the old South theme applied throughout comedy and music. 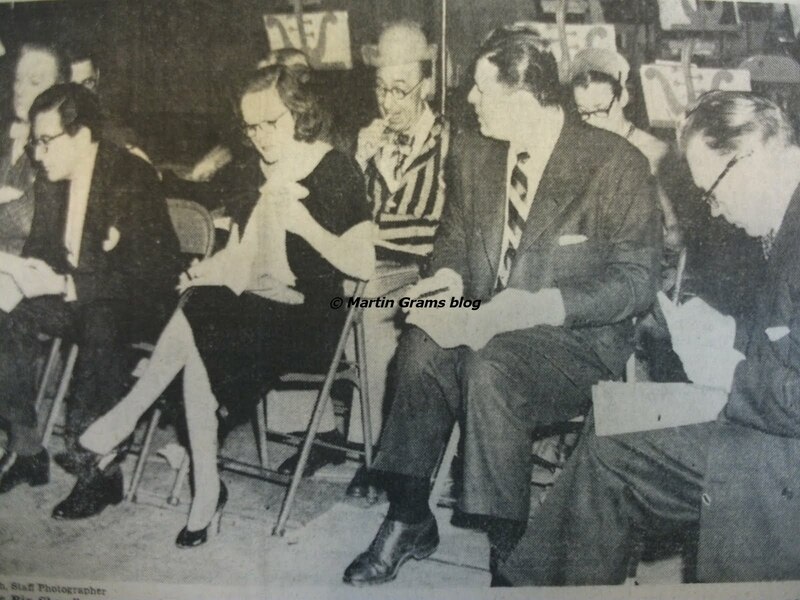 Trivia: During the pre-broadcast warm-up and also the entertainment following the actual broadcast, the various Southern guests were introduced to the audience and various gifts were exchanged between Tallulah and guests. Near the close of the broadcast, Bankhead thanked the Southern Show Train guests, mentioning that she had just been invited by the Natchez delegation to attend the Natchez Pilgrimage next Spring. The King and Queen of the Pilgrimage presented her with a special ante-Bellum costume which Bankhead wore when she attended the Pilgrimage. This broadcast originated from Hollywood instead of New York. The Reynolds commercial was provided by transcription, so announcer Bert Cowlan is still heard hocking Reynolds wrap. The “Tandem” commercials and the continuity announcements were done by a Hollywood announcer, Wendell Niles, marking his only appearance on the program. The regular announcer, Ed Herlihy, did not make the trip to Hollywood and remained in New York. During this broadcast, George Sanders starred in a radio version of the classic Honore de Balzac short story, The Mysterious Mansion (1830). Sanders played the role of Monsieur de Merrett, a French nobleman whose wife deceives him by entertaining a Spanish officer. When her husband returns unexpectedly, she hides her lover in a closet and tells the husband there is nobody around. The husband says he trusts her so well that he will never open the door to the closet where he had dared to think someone was hiding. Instead, he calls in a stone mason and has the closet sealed shut immediately. 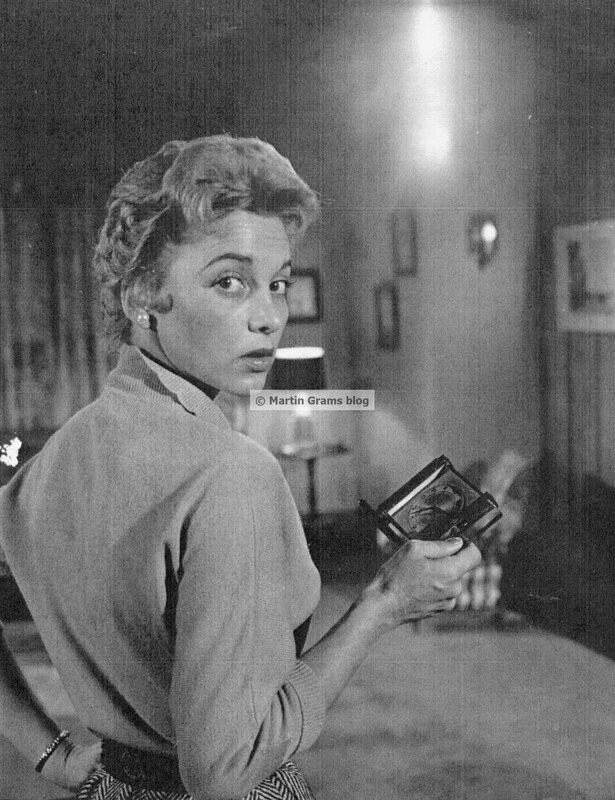 The role of the wife was played by Lurene Tuttle. Barney Phillips was cast in the role of the man. 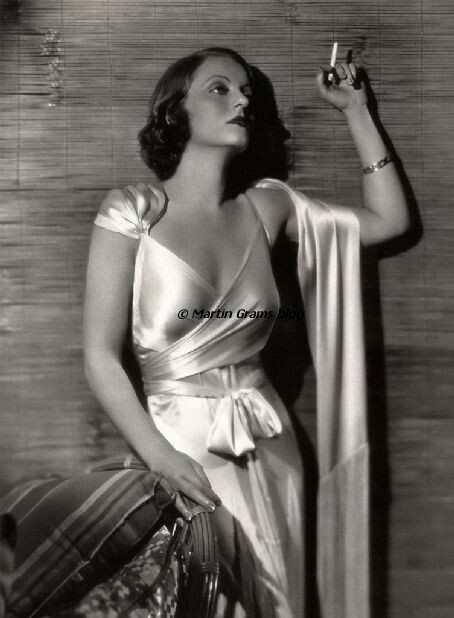 Tallulah Bankhead does a satiric monologue about the men who sit at the “left” at dinner parties. The monologue is provided by Dorothy Parker. Since this episode originated from Hollywood, this marked the only broadcast of the series Lurene Tuttle and Barney Phillips, character actors, would make on the program. Back in New York after last week’s one-time performance from Hollywood, the remainder of the series would be broadcast from the Big Apple. Jackie Miles does a monologue about Miami, followed by a story about golf. Ted Shapiro, pianist, accompanied Sophie Tucker in a medley of some of the songs she made unforgettable. Ann Sheridan than presented a radio version of the Fay Grissom Stanley story, The Last Day of All, recently published in Twenty Great Tales of Murder (1951, Random House), in which a wife and her husband poison each other and will at last be free of each other. Martin Blaine, radio and stage actor, played the supporting role of her husband. Sheridan played Sari, the wife who would rather see her husband dead than give him up to another woman. June Valli no doubt appeared as a result of the sponsor’s involvement. Following the guest spots, Tallulah Bankhead paid tribute to the observance of Armistice Day and read the letter written by Pfc. John J. McCormick, Marine, to two small daughters on the eve of his death in Korea. He felt a premonition that he might not live to write another letter, so he explained the meeting of living -- and dying -- for Freedom. Trivia: Ted Shapiro, who accompanied Sophie Tucker, was the co-author of “A Handful of Stars,” the opening theme song for The Big Show. Actors Dane Clark and Martha Scott co-starred in presenting a scene from the new 1951-1952 stage play, The Number, by Arthur P. Carter. Act One, Scene Three was done with Dane Clark as Dominic, small-time bookmarker, and Martha Scott as Sylvia, telephone bet-taker for one of the larger bookmakers. The story concerns the way these two people fall in love over the telephone, but realize that their lives will be in danger from the “Syndicate” if they ever meet. You see, in this “profession,” bookmakers and bet-takers are to be only “voices” over the telephone. Mary McCarthy, comedienne and musical comedy star, is accompanied by Graham Forbes, her regular accompanist. George Sanders joined Tallulah Bankhead in presenting the diminutive drama, Catherine Parr (1927), by Maurice Baring, with Sanders as King Henry VIII and Bankhead as Catherine Parr, the sixth and final wife. Drama concerned a breakfast discussion between the King and Catherine, with an argument starting about the way eggs are prepared for His Majesty. Martha Wright, night-club and Broadway star, currently doing her first big Broadway role as the Nurse in South Pacific, was also a guest. Phil Foster, comedian, did his own version of the “Egg Story” satirizing the Catherine Parr play. Foster pretended to be serving breakfast to the drug store counter clientele. Most of the guests took “bit parts” as they entered Phil’s drug store. Foster also did a monologue on naming babies. Foster’s “Naming Babies” monologue was written by Danny and Doc Simon. Martin Blaine, who played more supporting roles on The Big Show than any other actor, did supporting roles in the scene from The Number and other sketches. Dolores Gray, singing star of Two on the Aisle, sang “Shrimp Boat.” Ginger Rogers and Paul McGrath presented Act Two, Scene One of the Louis Verneuil comedy, Love and Let Love (1951), in which Rogers played Valerie King, toast of Broadway, and McGrath did the part of Charles Warren, her long-time friend and adviser. The Broadway play ran a total of 51 performances from October 19 to December 1, and just concluded a healthy run on the New York stage the day before this broadcast. George Sanders, dramatic star, did a take-off on Love and Let Love which Rogers and McGrath presented moments prior. Tallulah Bankhead took the role of Valerie King in the Sanders version. Lauritz Melchior, operatic star and concert singer, sang Leoncavallo’s Mattinata. Later, Tallulah, Sanders, Melchior and the choir sang “I Wish I Wuz” (I wish I wuz a singer at the Met…”) Near the end of the numerous verses, the other guests joined in. After the drama, the following comedy was presented: Wally Cox, comedian, did his original monologues “Dufo” (Dufo was a friend of mine, a crazy guy…) and “The Hinker” (about the man who wanted to invest in a night club). Fred Allen and Portland Hoffa did a take-off on his “Allen’s Alley” by knocking on the doors of all the guests to take a poll. The question is: “How many people like Tallulah Bankhead on Sunday night’s Big Show?” Allen and Portland also did a sketch, “The Allens at Home,” to show Ginger Rogers how the Fred Allen family normally live. Ann Southern and Robert Cummings, reprised their starring roles in the Broadway comedy, Faithfully Yours, by Bush-Fekete and Mary Helen Fay, presented an excerpt from the play with Southern as Vivian Harding and Robert Cummings as Thomas O’Harding. The Broadway play ran for a total of 68 performances from October 18 to December 15, 1951. The story concerned a wife who was interested in psychoanalysis and who interpreted her husband’s every action in the light of “complexes.” The husband was a man of routine -- had a day and a time for everything -- except love making. The love making, however, was what saved the marriage. Ed “Archie” Gardner, star of Duffy’s Tavern, told his story about Two-Top Gruskin, the famous baseball player on Duffy’s team, Duffy’s All-American Irish Yankees usually referred to as the D.A.A.I.Y. (This is the same monologue that Gardner recited on numerous other radio programs many times over.) Gardner also joined Tallulah Bankhead in a take-off on the Faithfully Yours excerpt presented a short time earlier by Southern and Cummings. Trivia: Even though Thanksgiving came and went, the Reynolds Metals sponsored segment (7 to 7:30 p.m.) offered a free copy of “Roasting Turkey in Metals Wrap.” Radio listeners were to write in to Turkey Department, Reynolds Metals Co., Louisville, Kentucky. This was the sponsor’s apparent attempt to gauge the size of the listening audience. A free book was offered almost every week beginning with this broadcast. Actress Rosalind Russell did a presentation of the A.E. Coppard story, Fifty Pounds (1948), the story about a young couple who have only love -- but no money. The man is a writer who is too proud to allow his wife to work. Finally, she decides to leave him because she can no longer bare the pain and frustration that comes to him every time he gets another rejection slip. Just as she is packing, she learns that her former employer has left her 80 Pounds! Because she knows her husband’s pride, she realizes he will not accept money from her so she mails him 50 Pounds “from an admirer who has read his works in the past.” She sees him open the envelope and put his 50 pounds into his pocket. He never tells her about the gift and bids her a fond, but heartbroken, farewell when she insists on leaving and working. His response reveals to her the true worth of his “pride and ideals.” Russell played Lally, the girl. Martin Blaine played Phil, the husband. Carl Frank was cast as the solicitor who informs Lally Repton of her bequest. Robert Merrill, operatic star, sang “Credo” from the opera, Othello. Margaret Truman, soprano, included among her songs the lovely holiday offering, “Oh, Leave Your Sheep.” Ozzie and Harriet Nelson were also guests. Alec Templeton, pianist-composer, did several of his original “impressions” including one of Tallulah singing “Ain’t She Sweet.” Tallulah read “Touch Hands” written by William Harrison Murray, especially for the Christmas season. The entire cast and guest roster joined in singing Christmas carols as part of the closing numbers on the program. The year was 1951. Rod Serling wrote a radio script titled “The Button Pushers,” a futuristic science fiction drama set in a future Earth, 1970. Huge television screens substituted for advertising billboards in Times Square, air-way rocket trains carried commuters overhead, and the fear of rival nations separated by a large ocean covered the front page headlines. A bloodthirsty general urges a brilliant scientist to complete the development of a new weapon, best described as a “doomsday bomb.” The enemy overseas, reportedly, has already developed a similar weapon. The general asks the scientist to complete the weapon so that it could be fired with the push of a single button – no secondary protocols required. The scientist, fearing his weapon could start a war that would erase the existence of mankind on the entire planet, contemplated the centuries of progress – ancient civilizations that built the pyramids, the deserted Mayan temples and the skyscrapers of today. After 15 minutes contemplating the beauty and wonder Earth had to offer, he completes the weapon and the Army takes over. Against his warnings, the button is pushed. The enemy does the same, and the countdown for contact begins. VOICE 1: Ah, Verus . . . Have you see the little planet – Earth? VOICE 2: Why no . . . come to think of it, Felovius I haven’t seen it . . . In a few hundred light years. Seems to have just disappeared all of a sudden. VOICE 1: Ah . . . Then I win my bet. VOICE 1: Yes, I bet the keeper of the North Star that the little Earth would destroy itself before the next billion years had gone by . . . and she has. She seems to have just blown herself up . . . disintegrated . . . she no longer exists. Tch, tch . . . Pity . . . she was a lovely little planet. Wonder what caused it? VOICE 2: That is a question . . .
VOICE 1: Oh, what am I thinking of . . . I know what destroyed it. It had human beings on it. I’d forgotten. VOICE 2: Well then, that explains it . . . Those pesky little things can’t live side by side very long. Shall we go back and tell the others? VOICE 1: Why take the trouble? As if anyone cared about tiny Earth . . . So unimportant a speck . . . so insignificant a dot in the universe. Who cares? VOICE 2: I guess you’re right. (sighs) Nice night . . . So quiet . . . So uneventful. 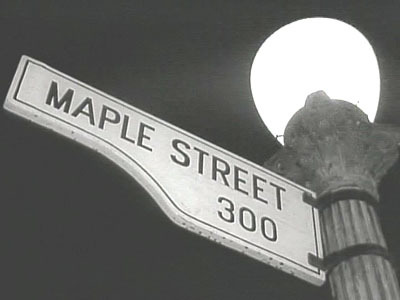 It appears that while The Twilight Zone was clearly ahead of its time, Rod Serling recycled the closing scenes from his 1951 radio play for "The Monsters Are Due on Maple Street," considered today by fans as one of the top ten episodes of the series. 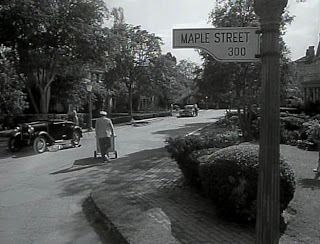 The entire episode was filmed on the New England Street on Lot 2 at M-G-M. Two outside prop rentals were required for this episode – a vending bike and a power mower, which cost Cayuga $50. Set designs including the “Maple Street” sign for the sign post, landscapes, automobiles and other props cost a total of $750. The exterior of the spaceship was filmed on the evening of the third day. Electronic instruments, garden tools and the illusion of the scenic view of Maple Street and the inhabitants in a panic, cost $1,000. 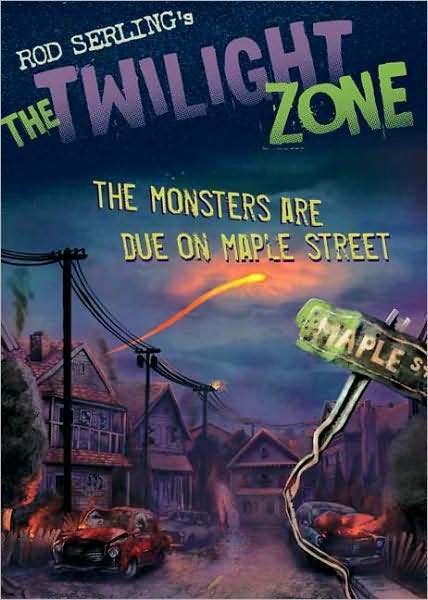 According to a letter dated November 28, 1959, “Along with schedule changes, ‘The Monsters Are Due on Maple Street’ has been delayed until a February or March date because of production problems.” This may explain why revised pages are dated November 12, weeks after filming was completed. It is possible that insert shots and revised scenes were re-filmed before the final film was put together. 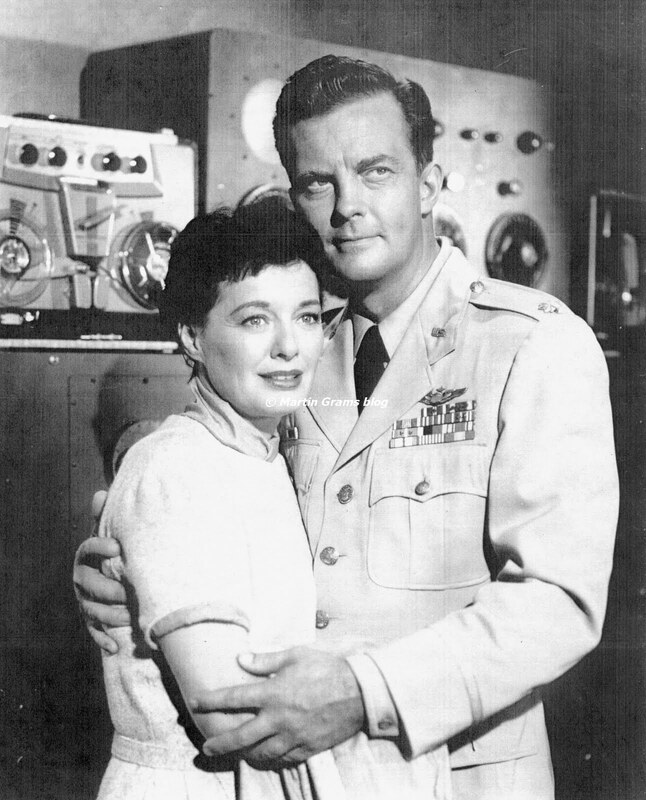 The Waterloo Daily Courier described the episode being an “excellent production.” Other television critics raved about the telecast, but viewers of education took note, and began writing in their praises. Joseph Janovsky, principal of a school in Brooklyn, New York, felt that the program contained the essence of a “Human Relations” course and requested in writing to Serling and Oscar Katz (vice president in charge of programming in New York) that he acquire a 16mm print of the episode for future courses and classes. Janovsky was not the only person to request a copy of the episode. John Bauer, Ph.D., a professor at City College of New York, felt that his classes would benefit greatly with an opportunity to review the production. “One of the outstanding frustrations in my attempt to further the education of my students is the solidly encased ‘It can’t happen here’ attitude which prevails among today’s college youth,” Bauer wrote. 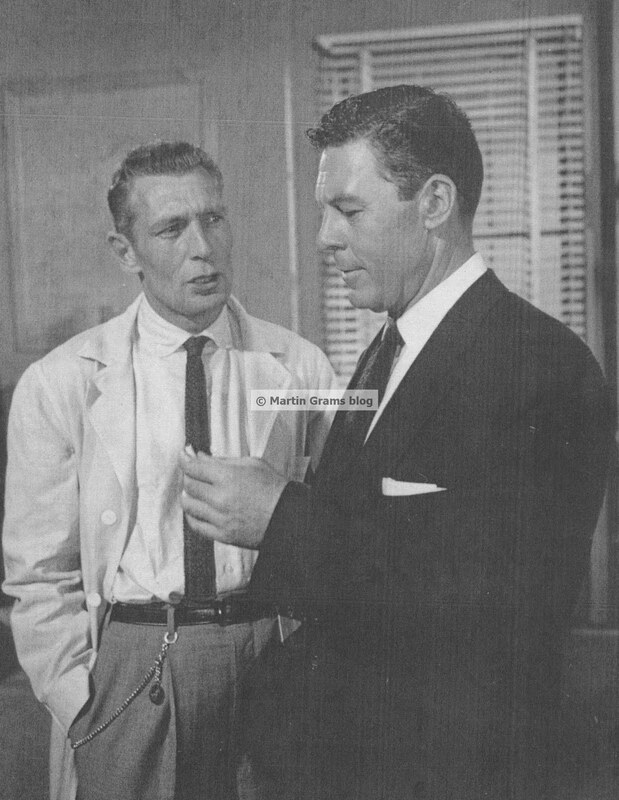 “Your play might help to break through the unrealistic complacency which marks their thoughts regarding most psycho-social disruptive forces.” Serling referred Bauer to Guy Della Cioppa of CBS at Television City in Hollywood, suggesting this might help Bauer avoid any red tape and acquire a print. 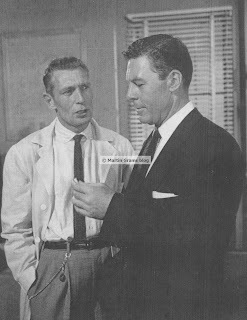 When this script was adapted into a short story for Stories from the Twilight Zone by Bantam Books, Serling made one noticeable change at the conclusion. He described how the sunrise revealed the remains of dead bodies draped about the streets and porches, and how, hours later, new residents had arrived to move in – with two heads for each new resident. The script itself has become a textbook standard, having been reprinted in a number of scholastic books over the years, so children of various ages could be exposed to the moral Serling emphasized. The pattern of conflict in a street when contact with the rest of the world is cut off closely resembled that of a teenage science fiction book titled The Year When Stardust Fell (1958), written by Raymond F. Jones and published by the John C. Winston Company. 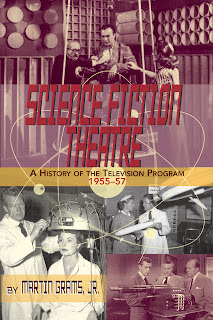 When a viewer brought this to Serling’s attention, he confessed that he was unaware of the book and sought out a copy to check its contents and settle his curiosity. The book concerned a mysterious comet that appears in the sky and is apparently the cause of all car engines, worldwide, to mysteriously overheat. By the next day, airplanes, trains, generators and other machinery does not function. Nearly in a state of panic, hysteria and superstition, the people of the Earth resort to mob rule in a fight for survival. In 1962, a book reviewer for Show magazine reviewed the book, and claimed it mirrored too much like Serling’s teleplay, unaware that the initial publication year pre-dated the Twilight Zone production. The premise of power shutting off all machinery to make a point was also explored in The Day the Earth Stood Still (1951), which may have been a brief inspiration for this episode. In the episode “Boom Boom Out Goes the Ed” of the animated television series Ed, Edd n’ Eddy, initially telecast November 11, 2005, the lead characters start to panic when the power goes out, and Ed claims the blackout is a result of evil mole people. 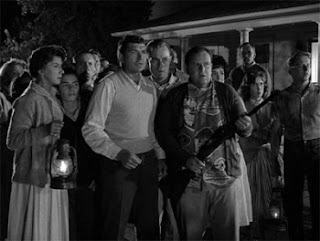 As the neighbors start to panic, á la spoof of this Twilight Zone, the children soon discover that the only way to stop the escalating panic is to take matters into their own hands. 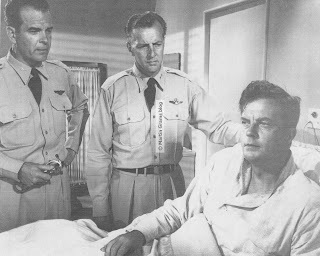 Cold War hysteria at its best was paid a second visit on the evening of February 19, 2003, when a remake of this same teleplay was telecast on a newer rendition of The Twilight Zone. One notable difference between the remake and the original was the driving force behind the hysteria. Instead of visitors from outer space, employees from a special branch of the U.S. government were responsible for the power blackouts. The government was conducting tests to see how small town America would react in the face of foreign terrorism. Three automobiles are featured in this episode: a 1959 Ford Sedan and a 1959 Ford Station Wagon. The station wagon was the same one the mechanic was working on in “Walking Distance” (verified by registration numbers). Script #20 dated: September 8, 1959, with revised pages dated September 24 and November 12, 1959. Cast: Claude Akins (Steve Brand); Sheldon Allman (Space Alien #1); Barry Atwater (Mr. Goodman); Anne Barton (Mrs. Brand); Joan Boston (silent bit part); Paul Denton (silent bit part); Ben Erway (Pete Van Horn); Mary Gregory (Tommy’s Mother); Lyn Guild (Charlie’s Wife); Jan Handzlik (young Tommy); Jim Jacobs (silent bit part); Jason Johnson (man one); Diane Livesey (silent bit part); Bob McCord (the ice cream vendor); Beryl McCutcheon (silent bit part); Burt Metcalfe (Don); William Moran (silent bit part); Vinita Murdock (silent bit part); Amzie Strickland (first woman); Joan Sudlow (woman next door); Lea Waggner (Mrs. Goodman); William Walsh (Space Alien #2); George Washburn (silent bit part); and Jack Weston (Charlie). Original Music Score Composed by Rene Garriguenc and Conducted by Lud Gluskin (Score No. CPN5882): Main Title (by Bernard Herrmann, :40); Maple Street (:30); What Was It? (:21); The Power’s Off (1:01); Tommy’s Outer Space Story (2:02); Uneasyness on Maple Street (1:15); Reaction (:08); A Kind of Madness (:07); Ruminating Suspicion (1:44); The Needling (1:01); Footsteps (:07); Lights and Suspicion (:57); Lights and Hysteria (1:30); One to the Other (:47); and End Title (by Herrmann, :39). Plot: Shortly after a mysterious flash of light hovers over Maple Street, late one afternoon, the power goes out – appliances, power tools, radios, even automobiles. 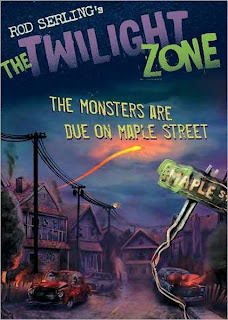 Before Charlie and Steve can walk into the next town to learn the source of the power failure, young Tommy warns the citizens of Maple Street that aliens from outer space are responsible. The young boy suggests that a few of them might already be living among their community. As the hours pass, suspicion grows as Les Goodman’s automobile starts up automatically, the lights in Charlie’s house come on, and everyone starts pointing accusatory fingers at each other. Charlie is quick to point a finger and ends up shooting Pete Van Horn in the streets, mistaking him for an alien. Charlie blames young Tommy for the comic book scare and the inhabitants become a mob. Stones are thrown and gun shots ring through the streets while the entire neighborhood turns into a murderous frenzy. High above on top of a grassy hillside, two aliens observe the massacre. One being explains to the other that if they turn off the power and throw the humans into darkness for a short while, they will find their own worst enemy – themselves. Having seen the results first-hand, the alien race plans to go from one Maple Street to the other until all of mankind has killed itself off. Minimum film residuals and minimum theatrical reruns applied. Remaining members of the cast varied from $75 to $100 per day. 1 Piccolo, 1 Flute, 1 Alto Flute, 1 Oboe, 1 English Horn, 2 Clarinets, 2 Bass Clarinets, 1 Bassoon, 1 Euphonium, 3 Horns, 1 Harp, 1 Tympani, 1 Vibraphone and Bass. 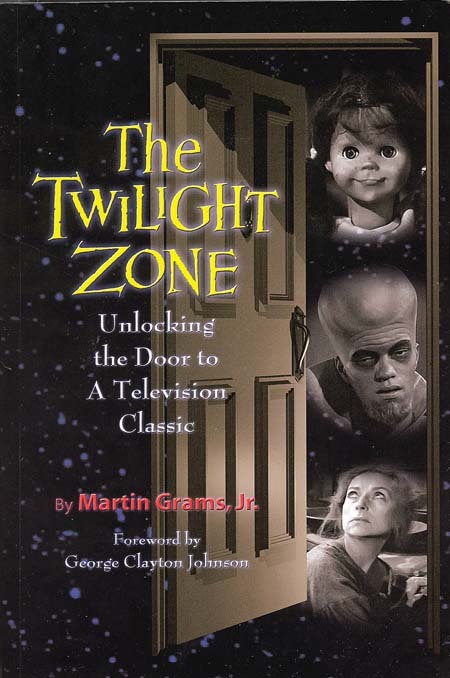 All of the above are excerpts from The Twilight Zone: Unlocking the Door to a Television Classic, by Martin Grams. This 800 page book was a recent winner of the Rondo Awards for "Best Book of the Year." Martin also provided audio commentary for the BluRay release of The Twilight Zone. Excerpts reprinted with permission from both the author and the publisher. Small reminder! You can subscribe to my blog at the bottom of the page. Each week's post would be e-mailed to you automatically so you don't have to continue revisiting the web-site!